Looking for a bus in Lakewood? Denver Charter Bus Company has access to hundreds of buses to take you to Red Rocks Amphitheatre, the Colorado Railroad Museum, and other exciting attractions. Set against a beautiful backdrop of the Green Mountains, Lakewood is a prime spot for hiking, fishing, beer tasting, and art gallery hopping. Because the city enjoys more than 100 parks in the area, you’ll find some of the best flora and fauna in Colorado. If the art exhibitions are more your style, spend time along the 40 West Arts District’s four-mile walking and biking trail, featuring over 70 works of public art. For group trips in our beautiful neck of the Colorado woods, call Denver Charter Bus Company today at (303) 495-2341 to help organize your charter bus rental. We have access to a variety of bus sizes, including compact minibuses, full-sized coaches, and everything in between. Because availability is limited, call us as soon as possible to reserve your group transportation in and around Lakewood. Because of its diversity in activities, as well as its proximity to cities like Denver and Boulder, Lakewood is an excellent destination for group events. If you’re planning a wedding, sports tournament, corporate conference, school field trip, or family vacation, we can supply you with safe and secure charter bus rentals, no matter the size of your group. What amenities do you need for a comfortable ride through Lakewood? Our charter bus rental experts will help you choose from among top amenity choices, such as reclining seats, luggage compartments, television monitors, WiFi, power outlets, and more. For long-distance trips to and from the Lakewood area, we’ll help you book buses with plenty of room to keep passengers comfortable on board and store luggage under the bus. This is where having WiFi and televisions aboard your buses comes in handy. Group members old and young will stay occupied as you travel to your destination. Flying into or out of Denver International Airport? Lakewood is less than an hour away by charter bus, and we’ll ensure that you have a comfortable ride to take you to your hotel. Book your bus for the duration of your stay to enjoy a personal chauffeur who can drive your group everywhere you need to go in Colorado and beyond. Looking for more trip ideas in the Denver-Aurora-Lakewood metro area? Read our guide to nearby popular trips for inspiration. 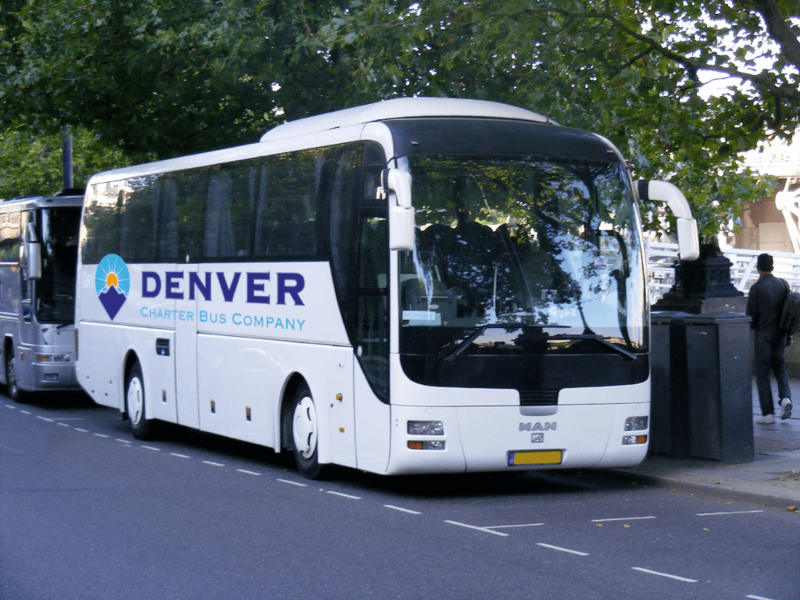 Save time, money, and hassle by booking a reliable charter bus today with Denver Charter Bus Company. Give us a call today at (303) 495-2341 for assistance in choosing a minibus or full-sized bus with the right amount of seats, amenities, and luggage space. We’ll provide you with a free, no-obligation quote for you to review, and the booking process is simple if you decide to book with us. Our reservation agents are looking forward to hearing from you!